Owner and Head Coach Karl Zeiner spent 10 years working full time and competing in endurance events before setting up DZ Fitness, so he knows how important it is to have personalised training arranged around you and YOUR life. Karl’s first endurance event was the Great North Run in 2000, but the bug bit and he has now completed a double Ironman, as well as racking up a long list of coaching qualifications. Karl offers coaching in very small groups from his base in Edinburgh, as well as the option of online coaching. 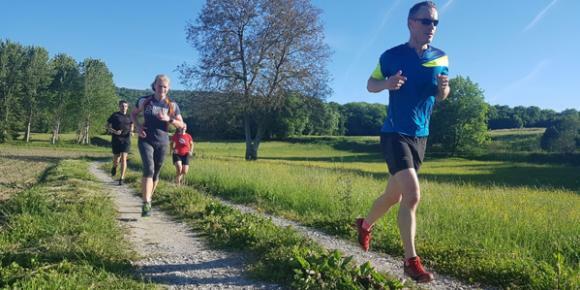 DeZeiner Fitness also runs a Pyrenees Triathlon camp, where you will swim in a beautiful mountain lake, run on lush trails and cycle in the Pyrenees, including a Haute Category climb from this year's Tour de France, making for an unforgettable all round experience. For more details, click on the Training Camps tab above. Karl’s coaching philosophy is “to provide a complete health package to my clients.” To achieve this, Karl’s coaching packages include Personal Coaching, Nutrition and Lifestyle Advice. These coaching packages will be on-line with personalised training plans & advice via the computer and phone. Triathlon, Swimming, Running and Ultra Marathon running are all covered. If you are local to Karl’s training base, then meetings can be arranged. Alternatively technical assessments and improvements are made via the use of video analysis and assessment of your technique. Individual Programming - unlimited email contact - up to 4 monthly 1-to-1 sessions - 15 min weekly call via phone or Skype upon request. 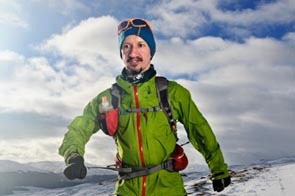 Karl has experience of coaching many Ultra Marathon runners, including events up to 100 miles. As an Ultra Marathon runner you will receive an individualised plan preparing you for your racing distance and target time. Comments: Woke early and had a small bowl of porridge, made my way to the start. Weather was good, light cold breeze. I started in the sub 3.50 catagory, and kept telling myself not to run to fast. Felt really good 5.12km pace, with 1m walking breaks at 19min. Through the first 10k in 54 min feeling great, enjoying the run. Gel taken at 1hr walk break. Through the half marathon in 1.54, and I am thinking I better watch I will die if I keep this pace up. But still feeling great so kept on at the same pace. Enjoying the crowd and the sunshine. At 20 mile 30 km still going strong 2.55. I am now thinking this last 10km is going to hurt…. and it did. Felt my pace drop, and had to add a few extra walk breaks but I still felt I was able to run past a lot of other runners. Felt no wall whatsoever, just a slight decrease in pace towards the end and a steady increase in my heart rate. The key new strategy for me was the walk breaks. Initially I was skeptical but I decided to trust Karl. This gave me a place to feed at and the mental resolve to stay strong, looking at my watch knowing I only had a small bit of time to run before my next break. In the last third I managed to run past many who were walking. I would recommend Karl if you want to take your race to the next level. Comments: I started training with Karl at the end of 2013 at the end of my first season of triathlon, having completed only 2 novice and 2 sprint tris. My own training programme was high in volume but unfocussed. With Karl’s help I did a half Ironman in May 2014 and am now training for a full Ironman in Sept 2016. This year I did a second half IM, qualified for the European Championships next year in Standard distance and did the 2 day Coast to Coast adventure challenge. I have recently started regular coached swim sessions with Karl and find him an excellent coach, picking out one specific area to work on at a time, building up to an overall improvement in technique (though as a late learner I still have a long way to go). Karl plans my week carefully, taking into account all the other things going on in my life, and is quick to respond by email to any queries I may have. I am totally confident that with Karl’s help I will achieve my IM potential next year. Comments: You are some kind of miracle worker. Comments: Karl took me from a very average 10k runner to not only a far better runner but an ultra-marathon runner in under three years. I blew away all my personal bests while training with Karl and had a seriously good time accomplishing goals I could only have dreamt of at the beginning. I live in Aberdeen which means almost all of our correspondence and planning was done over the internet. This was never a problem, and Karl was always available to chat over the phone if needed and even made detours while up this way to meet up and get some face-to-face training done. For anyone curious about Karl’s training style, I would have to describe it has thoughtful and determined; like any good coach he won’t let you quit easily. Sadly I couldn’t continue training with Karl forever but in the end, I accomplished a 39 minute 10k, a 1:35 hour half marathon, a 4:39 hour PB at the Glencoe Marathon (my first marathon) and another first with a time of 5:57:43 at the 37 mile (slightly longer that year) Speyside Way Ultra Marathon. I could not possibly be happier! Comments: Mo and I have now been with Karl for three years. Originally this was to help us with training for our first marathon. We had asked him to help as we are both in our 60’s and had only come to running a few years ago. Following the successful completion of the marathon we have moved on to new challenges with Karl’s assistance. Over the last year Mo’s challenges were her first overseas marathon in Malta, her first cycle sportive and an open water swim. With Karl’s guidance she completed all these, coming second in her age group, over 65 women, in the marathon. The open water swim was the biggest challenge, whilst a competent pool swimmer open water had posed some problems as it does with even many more experienced swimmers. 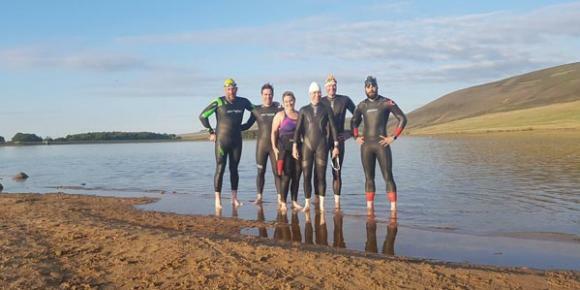 A week before the event, a ½ mile swim at Loch Lomond, Mo was very undecided but Karl persuaded her to have a go. On completion of the swim the smile on her face told it all, that smile was the highlight of my competitive year. My own challenges have been the Malta marathon, only my second marathon and a personal best. In triathlon I did my first half ironman distance event, the Outlaw Half, which despite the weather I completed in sub 7 hours and was second over 65 male and the Helvellyn triathlon, the run comprised the ascent and descent of Helvellyn, which is over 3000 feet high. Karl’s coaching has not only allowed us to complete the challenges he has also guided us to maintain or improve. For example our swim times have improved, which for us in our 60’s is extremely pleasing. Next year with Karl’s continued guidance and coaching we will be looking for new challenges. Comments: Karl laid out a simple and effective plan for me to reduce my ironman times from 13:37 at IM UK ‎in 2013 to 10:57 at IM Copenhagen in 2014. In 2015 we switched objectives and he got me in shape for the Celtman! Extreme Scottish Triathlon. His wealth of experience in multiple disciplines really shines through and gives you total confidence in your training and fitness come race-day. His ability to fit work-outs into and around work/family/social commitments proved essential for me to sustain training over 3 years. I have total faith in recommending Karl to anyone who wants to get fitter or faster.